Powered stair climbers are amazing tools. When you own a moving business or if you demand moving heavy loads every day, a powered stair climber is a very good investment. Find out why these tools are referred to as the working horses. Are your arms getting numb from the endless moving of your heavy loads? It is even more tiring when you move things upstairs! What can be the best remedy for your problem? Use powered stair climbers. They are your best solution when moving things upstairs. Powered stair climbers are best partners for your moving business. They are equivalent (and even more!) to what a human employee can carry. Their structure are made to move even large objects such as bath tubs, vending machines, stoves, appliances, gun safes, water tanks, musical equipment, speakers, computer systems and a whole lot more! They are versatile moving equipment with a high loading capacity. They can carry a weight load ranging from 700 pounds to a whooping 1200 pounds. These stair climbers are truly power machines and working horses in the moving field. Lately the Lectro-Truck Has become very popular, there are 6 different models available, check them all out by following these links. These power machines have proven that they are the true makers of converting a heavy work load to a lighter work load. They are equipped with steel handles making them more durable. These moving equipment are also built with an up and down switch to start your moving task with just a push of the button. To prevent damage to the walls and stairs, they usually come up with non marking vinyl pads for extra care and support. Their entire frame may be made from aluminum or steel material. For every powered stair climber model, each is equipped with a rechargeable battery and charger. It is best to charge your stair climber overnight to ensure full throttle of work the next day. 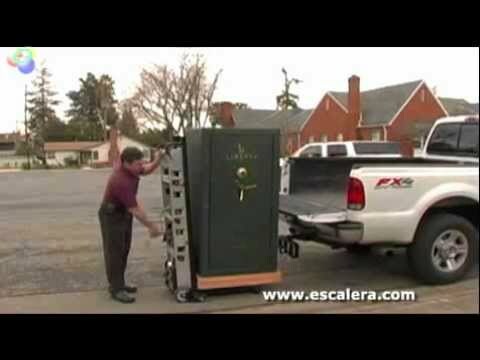 With powered stair climbers, your heavy load will really turn into a lighter load. If two men are needed to move a single vending machine, with these powerful working horses, you will only need one man. Saves you a lot from the cost of manpower, right? If you want to make your stair climber last, please do observe proper maintenance and care. Any strong and durable equipment will break if not properly maintained. Since they are usually made from metal, you need to store them in a dry place. As we all know, too much exposure to air and moisture will cause your moving equipment to rust. After using the equipment, be sure it is cleaned before you return it in its proper storage place. If you keep these in mind, your stair climbers will last as it should. So, what are you waiting for? Find out more about these working horses by taking a look at what the experts have to say about these powered stair climbers at handtrucks2go.com.